The rims a little soft, but the lighting is fantastic. Nice shot, and a good magazine cover, with a vertical format and space at the top that could carry type without spoiling the picture. I like the limited DOF, and the framing works well. Would make a nice cover, I think. Excellent. The framing really makes this work. Love it. Wow that is very nice. 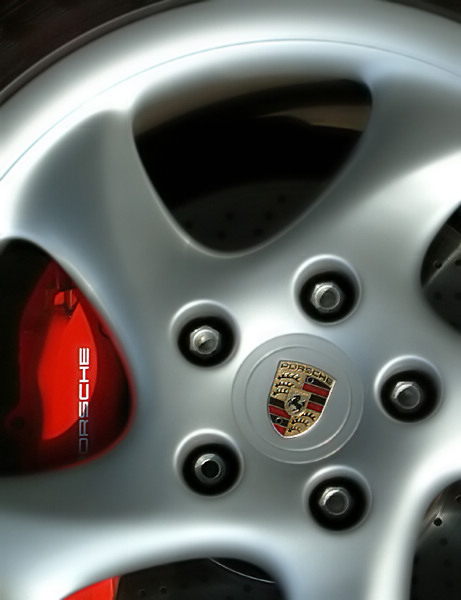 :) If you could have rotated the wheel a little to show the "p" on the calliper that would be even better. Or maybe shot it from a little higher. i can't imagine thos being shot with anything other than an slr. Very sharp, lighting is great! Mmm...Porche, I like the shot. Could have had alittle more detail on the marque but overall a good ol' 6. Pretty...good luck in the challenge. Should do very well. Very well done. Nicely cropped and composed. The rotor pads add a nice splash of color. Proudly hosted by Sargasso Networks. Current Server Time: 04/23/2019 05:52:37 PM EDT.